Whenever you go out into the woods and build a fire, you need to be cognizant of several things, most importantly the fact that you might be raining hell down on the environment if you aren't careful with your fire. Fire is a wonderful gift, it separates men from animals; however, with such a great gift comes a great amount of responsibility. The greatest responsibility that comes with the making of fire is the harnessing or controlling of fire. The good news is that there are several ways to do just that. Here are three things you must be cognizant of when building a fire this summer during your military surplus camping adventure, whatever it may be. 1. Use a reflector for a smaller fire. This concept is represented in the image that I have included with this article. A fallen tree is a great place to put a fire for many reasons. In this example it is because the tree roots offer a great heat reflector. Building the fire at the base of the exposed dirt and tree roots will allow the heat from the fire to bounce out and encapsulate the area with an aura of warmth which can be used for everything from climate control to curing meat. 2. Build your fire away from other flammables. 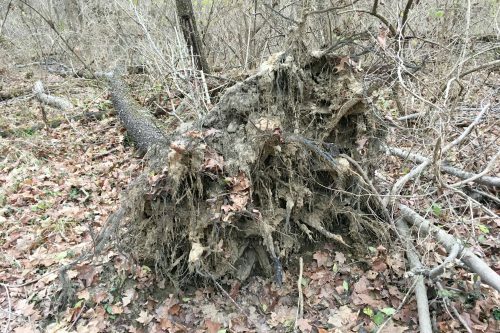 One of the other aspects of the pictured deadfall that makes it a great place to build a fire is the fact that the fallen tree has already dug a hole for a fire-pit. This is very important because you really have to be very careful with this stuff, because fire does not care what it burns. In essence, you should always build your fire where it doesn't have any fuel that you don't control. 3. Build your fire near a ready fuel source.Lastly, in regards to my submitted deadfall, this is the perfect place for a campfire because it is a dead wood source. Obviously the tree can't live when it is uprooted, and dead wood is perfect fire fuel.